A quick outfit post before I sleep. I have a client shoot tomorrow and it's non other than my favorite client-turned-friend Ethel! So I'm quite excited. Anyway for this outfit, I borrowed Mich's Mick Jagger shirt. Rock & roll. im in love with the tshirt and the shorts! :) beautiful outfit! Rock tees are always so cool! Love the edgy look it give to the blazer! Love Mr.J too! "bracelet used as belt" clap clap clap! lovet! why do my shirts look better on you? unfair. Just found you through Chictopia and I love your style! 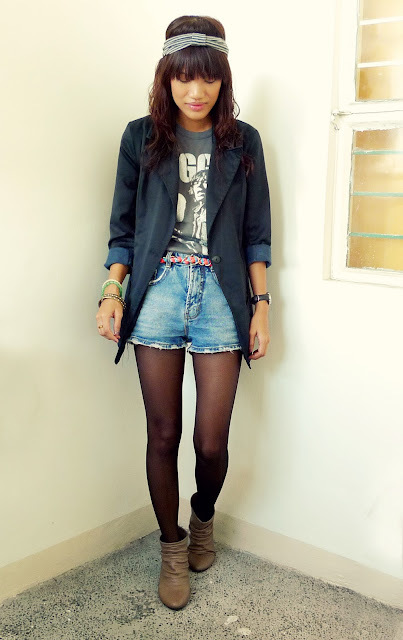 This outfit is very cute with that slight rocker touch to it =) Following you now! Please join my giveaway! Thanks! i found your looks in LB and I adore them.